“SpaceX achieved another historic first on Monday April 27 when they launched the country of Turkmenistan’s first ever commercial satellite. SpaceX continues to push scientific and economic advancements in the space industry. Unlike their other launches this year, April 27’s Falcon 9 was not intended for reuse; this design allowed the rocket to carry the added weight of Turkmenistan’s communication satellite. Turkmenistan’s satellite will be orbiting the Earth nearly ten times higher than the International Space Station; this is normal for commercial satellites. The communication satellite will bring improved television and radio broadcasts to the homes of Turkmenistan’s people. Read the rest of the article on Business Insider. Photo credit: Florida Today. Successfully landing a rocket on an ocean platform is the next step towards recycling boosters (as opposed to the current one-time-use nature of rocket boosters). If Space X can safely land on an ocean platform, rocket boosters can be flown back to shore and refurbished, significantly reducing the time and materials needed to prepare equipment between launches. Faster turn-around time and significantly lower costs would enable SpaceX and the industry as a whole to send more missions to the International Space Station to deliver supplies. Click here to continue reading the article on Universe Today. For a complete schedule of upcoming launches, click here. SpaceX and the Air Force have reached an agreement to use a former Atlas launch pad on Cape Canaveral Air Force Station as a landing site for returning Falcon rocket boosters. “The way we see it, this is a classic combination of a highly successful launch past morphing into an equally promising future,” Brig. Gen. Nina Armagno, commander of the 45th Space Wing, said in a statement. Before flying boosters back to shore, SpaceX must first show it can land safely on an ocean platform. 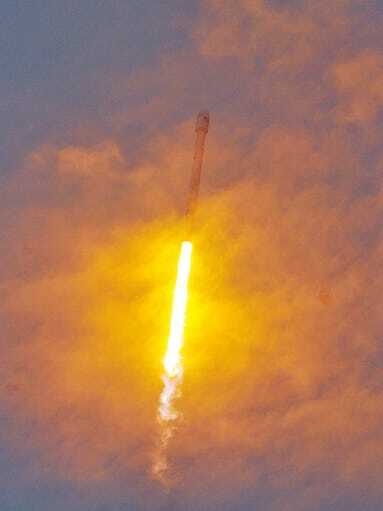 The company will make a second attempt to do that today after a planned 6:05 p.m. launch of a Falcon 9 with the Deep Space Climate Observatory. SpaceX envisions flying rockets back to shore, quickly refurbishing them and readying them for additional flights, a capability the company is confident would dramatically lower launch costs and revolutionize the industry. Now, liquid-fueled orbital rockets are called “expendable,” and are discarded after one use. SpaceX twice has landed boosters softly in the Atlantic Ocean, where they tipped over and broke apart in the waves. It has not been determined how many ocean platform landings might be attempted before trying to return a booster to the Cape. Located on “Missile Row,” Launch Complex 13 first supported a test of an Atlas intercontinental ballistic missile in 1958, and later launches of unmanned planetary probes for NASA and classified Air Force missions. It was deactivated in 1978 after more than 50 launches and designated part of a National Historic Landmark, according to Air Force records. 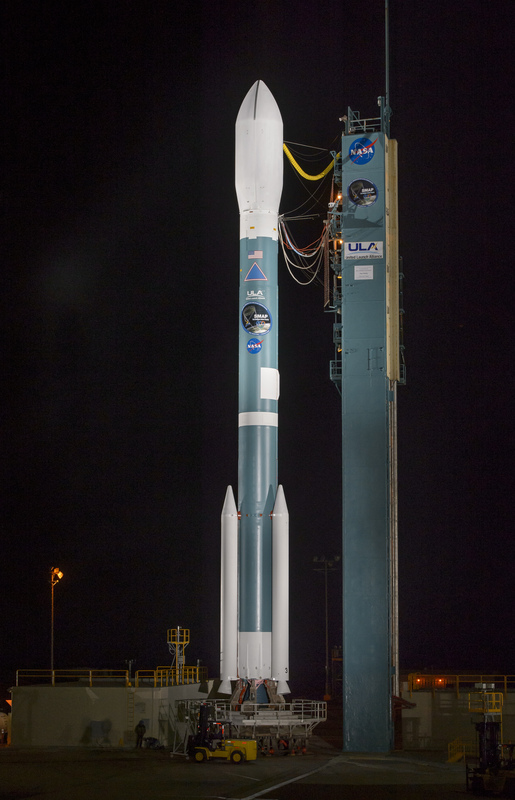 NASA successfully launched its first Earth satellite designed to collect global observations of the vital soil moisture hidden just beneath our feet. About 57 minutes after liftoff, SMAP separated from the rocket’s second stage into an initial 411- by 425-mile (661- by 685-kilometer) orbit. After a series of activation procedures, the spacecraft established communications with ground controllers and deployed its solar array. Initial telemetry shows the spacecraft is in excellent health. SMAP now begins a three-year mission that will figuratively scratch below Earth’s surface to expand our understanding of a key component of the Earth system that links the water, energy and carbon cycles driving our living planet. SMAP’s combined radar and radiometer instruments will peer into the top 2 inches (5 centimeters) of soil, through clouds and moderate vegetation cover, day and night, to produce the highest-resolution, most accurate soil moisture maps ever obtained from space. The mission will help improve climate and weather forecasts and allow scientists to monitor droughts and better predict flooding caused by severe rainfall or snowmelt — information that can save lives and property. In addition, since plant growth depends on the amount of water in the soil, SMAP data will allow nations to better forecast crop yields and assist in global famine early-warning systems. SMAP also will detect whether the ground is frozen or thawed. Detecting variations in the timing of spring thaw and changes in the length of the growing season will help scientists more accurately account for how much carbon plants are removing from Earth’s atmosphere each year. The SMAP team is engaged with many organizations and individuals that see immediate uses for the satellite’s data. Through workshops and tutorials, the SMAP Applications Working Group is collaborating with 45 “early adopters” to test and integrate the mission’s data products into many different applications. Early adopters include weather forecasters from several nations, as well as researchers and planners from the U.S. Department of Agriculture, U.S. Geological Survey, U.S. Centers for Disease Control and Prevention, and the United Nations World Food Programme. SMAP is managed for NASA’s Science Mission Directorate in Washington by JPL, with instrument hardware and science contributions made by NASA’s Goddard Space Flight Center in Greenbelt, Maryland. JPL built the spacecraft and is responsible for project management, system engineering, radar instrumentation, mission operations and the ground data system. Goddard is responsible for the radiometer instrument and science data products. Both centers collaborate on science data processing and delivery to the Alaska Satellite Facility, in Fairbanks, and the National Snow and Ice Data Center at the University of Colorado in Boulder. NASA’s Launch Services Program at the agency’s Kennedy Space Center in Florida was responsible for launch management. JPL is managed for NASA by the California Institute of Technology in Pasadena.